Janis Kuby’s groundbreaking introduction to immunology was the first textbook for the course actually written to be a textbook. Like no other text, it combined an experimental emphasis with extensive pedagogical features to help students grasp basic concepts. Now in a thoroughly updated new edition, Kuby Immunology remains the only undergraduate introduction to immunology written by teachers of the course. 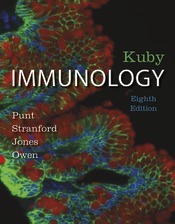 In the Kuby tradition, authors Judy Owen, Jenni Punt, and Sharon Stranford present the most current concepts in an experimental context, conveying the excitement of scientific discovery, and highlight important advances, but do so with the focus on the big picture of the study of immune response, enhanced by unsurpassed pedagogical support for the first-time learner. Owen, Punt, and Stranford, with special contributor Patricia Jones (Stanford), bring an enormous range of teaching and research experiences to the text, as well as a dedication to continue the experiment-based, pedagogical-driven approach of Janis Kuby. For this edition, they have worked chapter by chapter to streamline the coverage, to address topics that students have the most trouble grasping, and to continually remind students where the topic at hand fits in the study of immunology as a whole.